Picture this – we have a house with 4 inhabitants – a married couple with a young mischievous boy and a little petite girl. Sounds like a common neighborhood household right? Now the parents protect their children in every possible way, sometimes even against each other! Dad protects them against scolding from Mom when they don’t eat while Mom protects them against Dad’s wrath for breaking something in the house. The parents protect each other from their respective in-laws as well! But who protects them all? After a long hard day in school or office, everyone comes to the warmth and coziness of our protector i.e. our home. It acts as a shelter against the outside conditions like weather, pollution, noise etc., providing a comfortable night’s sleep and accountable for many memorable moments. Our home also needs its share of maintenance as it faces extreme conditions day in & day out. One way of protecting our home (and eventually ourselves) is by use of Siding on the outside structure. The paint on the outside of the wall is not sufficient for extreme conditions and Siding (Wall Cladding) is used as a weatherproofing casing for the house. There are multiple options while choosing the Siding material. Right from wood, clapboards, stones, plastic, metal, brick, Siding is available in all shapes and sizes. This not only protects the building but also adds an aesthetic appeal to the building and hence must be chosen with great care. Lot of factors need to go into deciding the material and the shape. For example, in snow affected areas, you would want proper insulation and titled siding so that the snow melts down. For modern or industrial architecture, we generally use Metal siding whereas most commonly used siding these days is the Vinyl Siding. To figure out the right fit and best vinyl siding colors for your house, you have to take into account the color of the roof, texture of the siding, neighborhood colors etc. 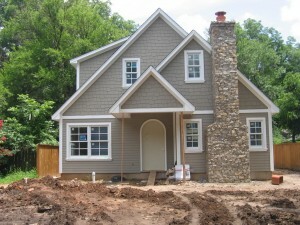 Siding comes in all colors and some of the best siding colors available are Platinum grey and Tuscan Clay. These are not only neutral colors but give a royal look to the exterior of the building. From the time of use of Aluminum & fiber cement as cladding, we can see a switch towards Vinyl cladding which is a manufactured product from PVC resin i.e. polyvinyl chloride. The cladding consists roughly 80% PVC while the rest of constituents impart the color, glossiness, flexibility, strength and durability. It is easy to maintain and last must longer than other natural materials like wood & boards. One frequently asked question is what is the best looking vinyl siding? As such there is no real answer to this, it is quite subjective and depends on the texture, size, location of the building. Another tough one is choosing the appropriate color of the siding. Commonly used and most popular vinyl siding colors include Sandstone, Burgundy & Military Blue. But as per me the best vinyl siding colors include Charcoal, Copper Penny & Champagne to add the imperial touch to the outside. Architecture – new constructions in city are generally kept as white while country houses give the additional freedom to experiment. Size – Best siding color for a large house might look tacky on the small one. Protecting the house should be treated as one time investment rather than looking at the higher cost up front. If you go for cheaper products initially, the maintenance and repair cost would be higher later. Also the color and material should be decided keeping in mind the factors like durability, versatility, flexibility, appealing to the eye and complimenting the overall house.